Plastic Figurines is a new play about a sister and her autistic brother relating to each other in the wake of their mother’s death. It is a funny and moving piece of writing – acutely observed and executed with nuance – that delves into familial relationships and explores how we relate to each other. Whilst the play looks at autism, the characters are like any brother and sister coming to terms with tragedy and trying to get along; in that sense, the story is universal. What made you want to you to commission this play? Box of Tricks has a long and proud history of spotting new playwriting talent and putting new plays on stage. From our very first collaboration with Ella – a short play for our project, Picture a City, at Liverpool Everyman & Playhouse’s Everyword Festival in 2012 – we identified a unique and engaging voice. We commissioned her to write a fifteen-minute play inspired by the word ‘division’ for our Word:Play tour the following year and the first incarnation of Plastic Figurines was born. The play was a story we knew needed to be told – funny, engaging, personal – so we asked Ella to develop the full play with us. Through our New Tricks initiative last year, supported by the Lowry, Ella and I have worked closely to uncover this beautiful new play and I can’t wait to stage the production and take it to audiences across the country. Why do you tour new work? Touring is a brilliant way to take new plays to diverse new audiences across the country and has become an important element of Box of Tricks’ work. There is a rich history of touring in this country and I still have a romantic vision of the “rogues and vagabonds” touring the land. Following our first small-scale tour of new plays double-header Head/Heart back in 2011, we haven’t looked back. We had such an amazing experience and loved the different responses wherever we went that we knew that touring had to become an integral part of what we do as a company. It was after that tour that we decided to up sticks, relocating the company from London to Manchester. For me, it is imperative that new plays – not just well-worn classics and big-budget musicals – are taken to audiences nationwide and that wherever you live in the country, you can see quality new writing. How does it fit in with your previous work? As a director, I am drawn to plays that delve into the personal and explore how we relate to each other and the world around us. Plastic Figurines is no exception. Recently, the company moved towards a commissioning model – whereby we develop a play from the seed of an idea, working with playwrights that excite us – and Plastic Figurines is the first commission to emerge from our New Tricks initiative. Over the last nine years, I have worked exclusively with new writing – taking new pieces from page to stage – with my company Box of Tricks. New plays excite me: the myriad possibilities in uncovering a new story, discovering a new world. I love working with playwrights and the alchemy of creative collaboration. I think theatre should always ask questions, whilst resisting proffering didactic platitudes. Plastic Figurines asks some big questions about family, tragedy, autism, whilst offering laughs along the way. The two characters at the heart of the play – brother and sister Mikey and Rose – are funny and flawed, human and relatable. So I hope audiences will leave the theatre entertained, engaged and challenged. I began directing plays at university and caught the bug. After uni, I took a year out and did some assistant directing at the Library Theatre in Manchester, observing the brilliant Roger Haines. I then embarked on a year-long directing post-graduate course at Mountview Academy of Theatre Arts in London. 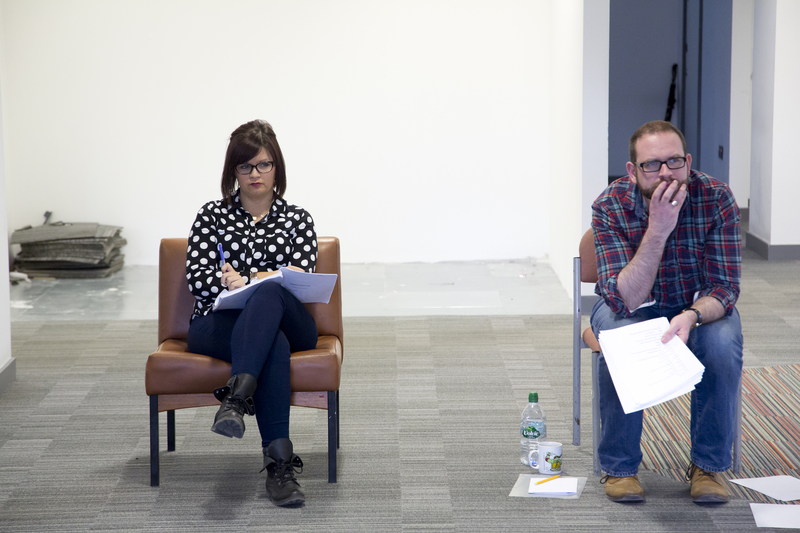 Whilst there, I devoured new plays and knew I wanted to work closely with playwrights. Six months later, I founded Box of Tricks with director Hannah Tyrrell-Pinder, who I met at Mountview, and we’ve been producing new plays ever since. Bringing a new play to stage is the culmination of years of hard work, a creative collaboration between not just director and playwright, but actors and a whole creative team. That’s what I love about theatre: the coming together of various talented individuals with the shared goal of realising a production. But theatre simply isn’t theatre without an audience: so seeing your production on stage in front of an audience is an incredible feeling, gauging people’s reactions and sensing whether a play flies or not. There’s nothing quite like it and is why we put in all the hard work – the blood, sweat and tears. 90% of a director’s job is finding a great play and a great cast. The rest will follow. Plastic Figurines is a funny and moving new play that should make you laugh and make you think. It’ll be a 70-minute emotional, theatrical rollercoaster ride. New plays are the lifeblood of theatre and it’s imperative we continue to uncover new stories and discover new talent. Plastic Figurines is one of the best new plays I have had the pleasure to read and help bring to life. What is next for Box of Tricks? Last year, the company underwent a comprehensive period of organisational development without any productions. This year, we’re hitting the ground running with our most ambitious season to date: following the national tour of Plastic Figurines, we’re staging two new plays from two other North West playwrights – Narvik by Lizzie Nunnery and Chip Shop Chips by Becky Prestwich – whilst developing more new plays for the future. Watch this space!